The Sunbeam Snake, a large snake of the Indo-Malaysian region, is a chocolate-brown to black snake that reaches 3 feet in length. Its skull is quite stout, but its lower jaw is significantly more flexible than that of the pipe snakes. Unlike many of the advanced snakes which have only one lung, the Sunbeam Snake still has two, but it lacks the pelvic girdle. Its scales are highly polished and overlapping, thus providing minimum friction with the soil and little space for lodgment of dirt or parasites on the outside surface. The polish derives from the way the surface cells of the skin lay down the keratin. As in some other burrowing snakes, this involves microscopic parallel ridges oriented along the snake’s length. 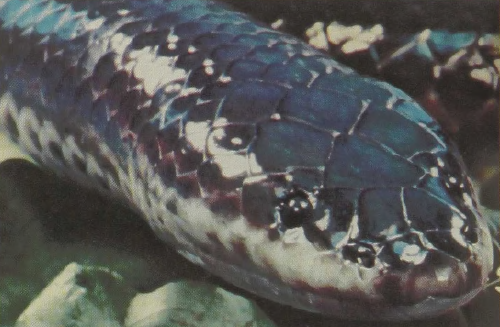 The ridges act as a diffraction grating so that this normally unicolored brown snake shines in the colors of the rainbow when sunlight strikes it, hence its popular name.